Slice the tofu into squares approximately (1/4 inch, 5mm) thick. Cut the pork into small cubes (1/2 inch, 10mm) thick. Place the ingredients near the stove where you will need them. Add anchovies to water, let them soak for 10 minutes before cooking. Boil the anchovies for about 10 min, then let rest for 10 minutes. Add gochujang to the dashima water. Add a tablespoon of sugar and stir it in. Add pork and potatoes to the stew. Bring the stew to a boil, and cook for 5 minutes. Add the onion and zucchini to the stew. Add a tablespoon of minced garlic. Continue to boil for 5 more minutes. Then finally add the mushrooms and tofu and cook another 2 minutes. 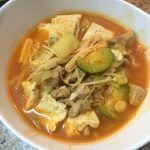 Ladle the Jjigae into a bowl and serve. Be sure to use a stock pot large enough to hold all the ingredients and one that has a heavy bottom. Having a stock pot with a heavy bottom is important because the bottom of the pot will shield the stew from being scorched by the heat from the stove.